A year and a half ago, I decided to make a quilt for our master bedroom using a selection of 4 batik fabrics. I originally decided to go with a variation of the 2014 Star Light Star Bright quilt along hosted by Melissa from Happy Quilting (I opted for variation 4 in case you were curious). I drew up the pattern in EQ7, purchased fabrics, and it sat in a drawer and was never touched. 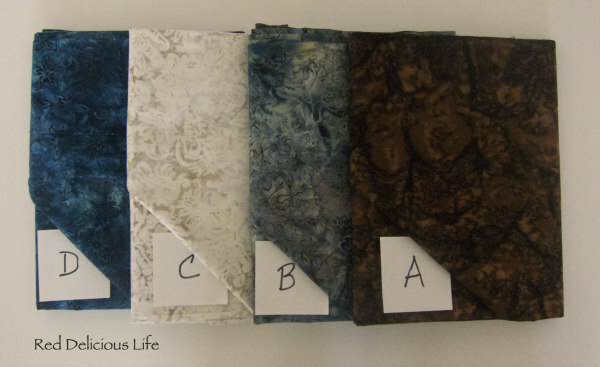 I'm not sure what held me back but now that so much time has passed, I've decided to use these fabrics for the Midnight Mystery quilt along that Cheryl from Meadow Mist Designs is hosting. As much as I wanted to keep the mystery alive, I really needed to know what I would be working with since I would be enlarging it to a queen size quilt. Cheryl was very accommodating in giving me a sneak peek at the finished project and I think it's going to be perfect. The fact that it required a minimum of 4 fabrics, all of which I had, and with enough yardage to make it work, it just feels right. Our bedroom walls are currently a dark blue and we have dark brown hardwood floors with white curtains. I think these will be perfect. July's task is cutting out fabric. I'm a bit behind but I'm sure I can catch up. How great that the fabrics will work with Cheryl's design and be able to be upsized to fit your queen bed! I love the batiks they will look great. It's great that you already had the fabric you wanted to use. I had to peek too I'm really horrible with surprises. Trying to pick fabric for something not know how it will look was killing me. Piggy Bank Challenge - Complete!